Dementia is a general term for a disease that changes memory and/or thinking skills severely enough to impair a person’s daily functioning. It is not part of normal, healthy aging. Dementia is a general term for any disease that causes a change in memory and/or thinking skills that is severe enough to impair a person’s daily functioning (driving, shopping, balancing a checkbook, working, communicating, etc.). There are many different types of dementia, the most common of which is Alzheimer’s disease (AD). Most types of dementia cause a gradual worsening of symptoms over the course of years due to progressive damage to nerve cells in the brain caused by the underlying disease process, which is referred to as neurodegeneration. The symptoms of dementia vary from person to person and may include memory problems or mood changes or difficulty walking, speaking or finding your way. While dementia may include memory loss, memory loss by itself does not mean that you have dementia. While some mild changes in cognition are considered a part of the normal aging process, dementia is not. The cause of dementia is unknown in many cases. Research is ongoing to better understand what causes dementia, but the underlying mechanism is a thought to be related to a build-up of proteins in the brain that interferes with how the brain functions or works. Neurodegenerative diseases, like frontotemporal dementia, lead to abnormal protein build ups in the brain. Different protein build-ups are seen in different types of dementia. For example, proteins called beta-amyloid and tau are associated with Alzheimer’s disease while the protein alpha-synuclein is associated with Lewy body dementia. Changes in the blood vessels in the brain may result in vascular dementia. In a minority of cases, a reversible cause of a person’s dementia can be identified and treated. Screening for these reversible causes is part of the diagnostic evaluation for anyone with changes in memory or thinking. How is Age Related to Dementia? Age is the greatest risk factor for dementia. Dementia becomes increasingly common as people age, though this does not mean that dementia is a part of normal aging. Dementia is an illness that affects up to 40% of people over 85 years old. People with dementia may have different symptoms, depending on the type and stage of their particular dementia. A person’s symptoms depend on which part of the brain is affected by the disease process, and they may change over time as the diseases progress to involve different areas of the brain. 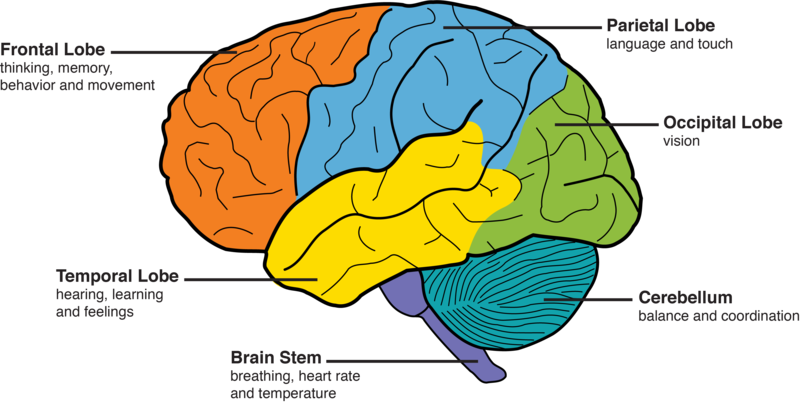 Different types of dementia tend to target particular parts of the brain. For example, the part of the brain that is important for the formation of new memories is usually affected early on in AD, which is why short-term memory loss is often one of the first symptoms of AD. Other common symptoms in dementia include difficulties with communication, planning and organization, navigation, personality changes, and psychiatric symptoms such as depression, anxiety, delusions and hallucinations. Are There Medicines to Treat Dementia? There is no cure for dementia yet, but there are medicines that can help treat some of the symptoms of dementia. There are medications that may improve memory for a period of time. There are also medications that are effective for treating mood disorders, such as anxiety and depression, which commonly occur in people with dementia. It is also important that your provider carefully evaluates any medicine someone with dementia is taking, because some medications may make memory symptoms worse. Research has shown that physical exercise helps to enhance brain health and improves mood and general fitness. A balanced, heart-healthy diet, such as the MIND diet (based on the Mediterranean and DASH diet for hypertension), and limited alcohol intake are other important ways to promote good brain health. Getting good sleep at night is another important component of brain health. This includes maintaining a normal sleep/wake cycle, practicing good sleep hygiene and recognizing and treating sleep disorders. Staying socially active and engaged in enjoyable, mentally stimulating activities helps to promote good mental health. Other illnesses that can affect the brain, such as diabetes, high blood pressure and high cholesterol, should also be treated if present.